Early morning when the streets are quieter! We are comparing Paris Segway Tour Plus Seine River Cruise Prices from leading ticket suppliers and Try to find you Cheap tickets prices on the market. A unique way to explore the city of Paris and see all of the monuments, benefiting from street views and river views. The segway tour is led by a friendly and informative local guide who will show you the most atmospheric and picturesque streets of Paris as well as all of the most famous monuments, sights, and buildings. The 1 hour river cruise has an open upper deck and indoor seating below from where you can watch the most beautiful and iconic attractions float past including the Eiffel Tower, Musée D'Orsay, Hotel de Ville and so much more. Enjoy comparing the views from the river with the views from on the street with your segway tour. No experience required - You'll be given guidance and a practise session on operating the segway. Not recommended for kids under the age of 10. Not suitable for pregnant women, people who suffer from back pain, heart conditions, or other serious medical problems. Your Experience With Paris Segway Tour Plus Seine River Cruise? 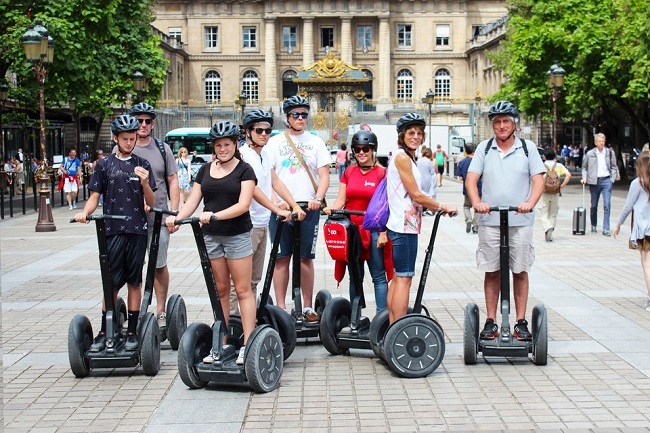 Meet your local guide at the meeting point and get acquainted with your segway with a warm-up session for those who've never used a segway before plus safety demo before being allowed lose on the streets of Paris! You'll then glide effortlessly through the Parisian streets as your guide leads you through the most atmospheric parts of the city to the most iconic monuments. You'll be able to see the Eiffel Tower, glide along the Champs-Elyse?es, past the Arc de Triomphe and so many more iconic attractions, stopping briefly at each one as your guide explains the history and the importance of these sights. After the segway tour you're free to board any of the 1 hour cruise boats and you'll be able to enjoy another side of Paris as you cruise under the enchanting bridges including the Pont Neuf. What Paris Segway Tour Plus Seine River Cruise Includes? For the segway part, where flat shoes and have a backpack rather than a shoulder bag. Travelers Reviews about Paris Segway Tour Plus Seine River Cruise? This combo cruise and segway tour gets great ratings and very good reviews from travellers on Get Your Guide, Trip advisor, and Viator. Everyone agrees that the guides make the trip being friendly, fun, and informative and that the segway plus the boat cruise are a great introduction to Paris. People describe it by saying "Sensational! One of the best things we did in Paris. The guide was full of energy and lots of fun." "The segway/boat tour was a great way to see Paris"
The only negatives are from people wishing they had more time to stop and take photos on the segway part of the tour though they had amble time to do this on the cruise. E-tickets and printed tickets are accepted. Dress appropriately - The tour still takes place even if it's raining! See confirmation email for details - Varies depending on booking website. Duration: Unlimited 1 day travel - A round trip takes 1.5 - 2 hours. Duration: 75 minutes or 2 hours depending on option chosen and booking company.